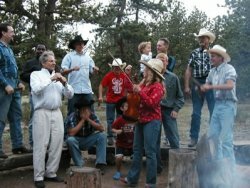 Work at a Real Western Dude Ranch! For the job seeker that would like to call the great outdoors their office, there may be no better place than a dude ranch. Located in some of the most pristine destinations, dude ranches seek to offer an experiential travel experience to their guests. Forget the poolside pina colada; guests that come to the ranch want to engage with their surroundings. As a ranch worker you will help create this experience and in the process, consider horses to be some of your best colleagues. Dude ranches are mostly found in the Western United States in states including Arizona, Arkansas, California, Colorado, Idaho, Montana, Nebraska, New Mexico, Oregon, South Dakota, Washington, Wyoming, as well as in Alberta and British Columbia, Canada. They tend to be boutique in size, ranging from around a hundred guests at a time to just a handful. Due to their intimate size, ranches tend to employ a small staff, but each employee truly gets to experience all aspects of ranch life. Since ranches are often family-owned, the corporate structure that other hotel or resort jobs may follow doesn't typically exist at a ranch. Every worker should expect to be involved in multiple aspects of the ranch, no matter their specific position. Dude ranches come in a few varieties and depending on the type will influence which types of employment opportunities are available. A working dude ranch is exactly how its name describes. It will be a sheep or cattle operation, and the day's adventures will be determined by the work related to them. At a standard dude ranch, horseback riding will be central to the majority of the activities guests partake in. While at a resort dude ranch, extra amenities such as spa, tennis and golf may be offered. Common positions at a dude ranch include wranglers, cooks, food and beverage servers, housekeepers and maintenance workers. Regardless of the position, jobs on a ranch typically involve hard work, often physical in nature, and long hours. Living and breathing ranch life also creates a great sense of unity and family-like camaraderie that extends not only to fellow ranch workers, but also to the guests. The intimate setting and daily interaction between the staff and guests is so vital to the overall experience. Additionally, as room and board on the ranch is often part of compensation, expect to truly never be far from work. For the job seeker that wants a seasonal commitment, ranches are a very good option. Most seasonal employees are hired by southern ranches from September through May and by northern ranches from May through October.